Teething Product Dangers – Help Get Word Out! Teething medicine lawsuits currently being filed on behalf of children experiencing seizures after using teething products containing belladonna and children diagnosed with methomoglobonemia from teething products containing benzocaine. The FDA is warning consumers to stop using all teething products that contain these toxic ingredients. Every parent knows the horrible feeling of not being able to help a teething child. We have all searched for ways to end the misery we see our precious infants go through when new teeth come in. So, it is no surprise that products claiming to give relief to teething infants would be highly sought after. It is imperative that all parents understand that these teething medicines are not likely effective and have been linked to fatal injuries. Parents must discard these products immediately. The FDA issued a number of different warnings asking manufacturers to stop selling teething products. Below are the largest brand names, but, any parent that has a teething gel, tablet, spray or topical ointment in their home should immediately confirm that the product does not contain either benzocaine or belladonna. If the product contains either, discard the product immediately. 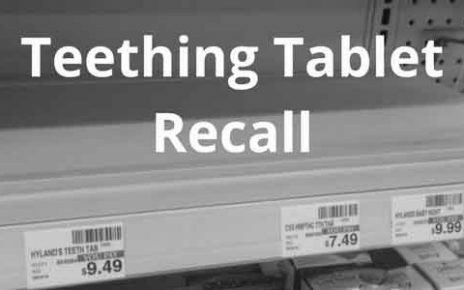 The first teething tablet lawsuit was filed on April 21, 2017 on behalf of two children taking Hyland’s homeopathic teething products who later experienced seizures. One of the children died as a result of the seizure. Matos and Sanchez v. Hylands Inc. can be accessed here. The teething tablet lawsuit against Hylands allege that the manufacturer disregarded known belladonna side effects rand continued to sell these products without informing or warning the public, including the two victims. As awareness of the link between teething products and the risk of fatal injuries becomes more well known, we expect to file more lawsuits to help get answers for families left with children experiencing unexplainable injuries. Sudden infant death syndrome (SIDS) is the unexplained death, usually during sleep of a seemingly healthy baby less than a year old. Rubbing a teething baby’s gums with teething ointment prior to putting them down to sleep has been a common practice for years. Sadly, we are now talking to families who are asking whether the horrific SIDS diagnosis could have been explained by the use of a teething product. Until recently, it was common practice to apply topical teething products to baby’s gums to relieve the swelling and pain that accompanies the break-through of teeth between the ages of 6 to 24 months of age. Products such as gels, sprays, ointments or tablets were often used as a numbing agent and were thought to dull the nerves in the gums, but the FDA is now questioning whether this was ever effective. According to the National Institute of Health, belladonna poisoning can lead to baby teething seizures and is likely unsafe when taken by mouth. It contains chemicals that can be toxic and side effects can include dry mouth, enlarged pupils, blurred vision, red dry skin, fever, fast heartbeat, inability to urinate or sweat, hallucinations, spasms, mental problems, convulsions, and coma. So, why is a product widely regarded as unsafe included in the list of ingredients for our most vulnerable citizens – our infants? Because the FDA does not test homeopathic and herbal supplements for safety or effectiveness. Instead, homeopathic drugs must meet the standards established by the same people who profit from them -– The Homeopathic Pharmacopoeia of the United States (HPUS). Members, who are in the business of homeopathy, govern HPUS. As long as the HPUS includes belladonna in their “Official Homeopathic Drug” list, it may legally be included in a homeopathic medicine, even medicines given to infants. On May 23, 2018, the FDA warned consumers that over the counter (OTC) teething products containing benzocaine pose a serious risk to children. According to the FDA warning, the key ingredient benzocaine could cause methemoglobinemia, a serious blood disorder. The FDA announced that teething products containing benzocaine should no longer be marketed and will be taking further action against manufacturers if they do not take action to remove the product. Furthermore, the FDA noted that these products did not demonstrate any benefit for teething pain. This was not the first time the FDA warned the public about the danger of benzocaine-associated methemoglobinemia. The FDA first warned about the potential dangers in 2006 and repeated this warning in April 2011 as they continued to receive reports of injured children. Chloe is a beautiful 15 month old baby who became unresponsive 10-15 seconds after her mother, Danielle, used a “pea-size” amount of Baby Orajel Nighttime Pain Relief Gel on her gums. Danielle described Chloe as immediately turning red and starting to kick and scream but then suddently becoming unresponsive. Chloe’s eyes locked in a dead stare, she became limp, turned blue and stopped breathing. Luckily for Chloe, this episode was not fatal, she awoke less than a minute later. Danielle shared her story in a viral Facebook post that has been shared over 100,000 times. Thanks to Danielle, many parents threw out their Baby Orajel products and continue to warn other parents of the danger lurking in their cabinets. The comments to Danielle’s post tell the story that Chloe’s experience was shared by others. TruLaw joins a growing group of advocates trying to get word out about the dangers of using teething products. If you are also a member of this grass-roots group and can offer helpful alternatives, please reach out and we will include your suggestions below. We applaud all efforts to help keep kids safe from harmful products. How Do I Pick a Teething Gel and Tablet Lawyer? Sometimes you need a lawyer near you and sometimes its best to hire a lawyer based on the lawyer’s resources and experiences. The right lawyer for mass-tort litigations may not be your local lawyer. Mass tort cases filed all over the country are often consolidated into a single courtroom in order to move the many lawsuits through the courts in the most effective and efficient way. A lawyer experienced with the multidistrict litigation process with the ability to represent clients in all 50 states, is likely to be a good fit for mass tort litigation. TruLaw is not afraid to take on companies like Standard homeopathic/Hylands. We work with trusted legal affiliates to make sure that TruLaw clients have the resources and experiences needed to hold big business accountable when they put profits over people. How Can a Teething Medicine Lawsuit Help? The goal of your teething tablet lawsuit is to help your family financially recover from injuries that were caused by someone else. We hope putting your trust in TruLaw will take away your concern of protecting your legal rights, but it is most important to us that your child stops taking the teething tablets if they are still in the home and that you attend to his or her medical needs. Your child’s lawsuit should assist in covering any medical bills that occurred as a result of the belladonna toxicity, the amount of income and benefits that you lost as a result caring for your child and, if your child’s injuries are permanent, we will look to recover for these permanent injuries as well. In addition, it is always our hope that your lawsuit will help us to remove dangerous products from the market. We are not only lawyers, but also safety advocates that believe in getting information out to the public so no more people are injured. We hope you will join us in the role as a safety advocate to make sure that individuals understand that Hyland’s homeopathic teething tablets are dangerous and should be removed from use. Has There Been a Teething Tablet Settlement? There have been no discussions of teething tablet lawsuit settlements as the first cases were filed in April, 2017 and we are early in building these cases. We understand the frustration in waiting to hear about settlements in product liability lawsuits. TruLaw lawyers building our cases with an eye on winning in court as well as settlement, when we believe that is the best result for our clients. We will never settle without advising you of your options, and we will keep you posted on our progress, to the extent we are legally able. Is there a Teething Tablet Class Action Lawsuit? A Mass tort refers to civil actions involving numerous plaintiffs against one or a few corporate defendants in state or federal court. Class actions are mass torts that are generally used on financial losses and multidistrict litigations (MDL) are generally used on personal injury claims, often in product liability cases. MDL is a procedural tool used when plaintiffs have incurred injuries from products manufactured by the same defendant(s). Even when plaintiffs incur injuries from the same defendant(s), the amount of damages they may recover for those injuries are often substantially different from other plaintiffs included in the same lawsuit. Why is there a Teething Tablet Lawsuit? A corporation, by definition is profit seeking. There is no requirement that a corporation act morally. Unfortunately, too often we see dangerous drugs, devices and products, even homeopathic products, remain on the market when corporations prioritize profit over people. If these same corporations warn consumers of these risks, there is no case. We only pursue lawsuits on behalf of individuals who were not warned of the risk associated with the dangerous drug, device or product on the market. 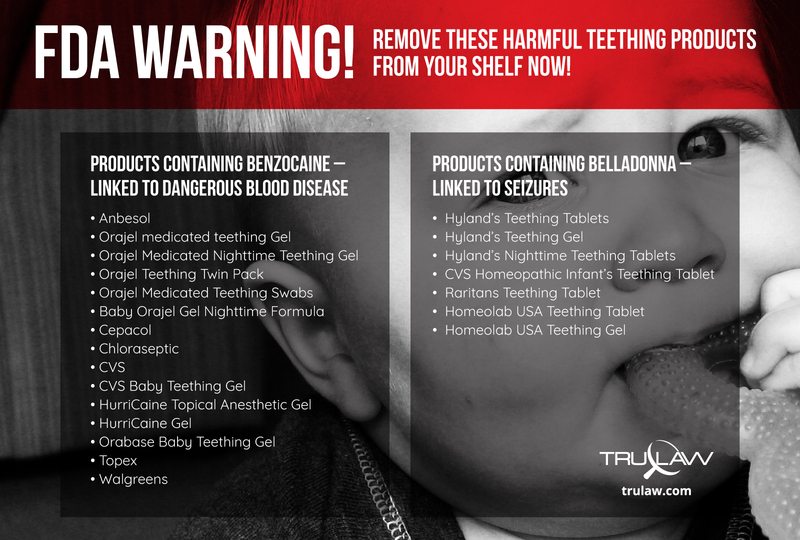 TruLaw is pursuing Hylands Teething Tablet lawsuits because we believe consumers were not properly warned of the risks of injury from belladonna poisoning. Should you file a Teething Product Lawsuit to protect your legal rights? Did your child use teething tablets or gels? Did your child then develop complications or serious injury? If you answered yes to these two questions you should look into your legal rights.Fill out our Secure Teething Product Instant Case Evaluation if you believe you may need to protect your legal rights. View Your Teething Product Case Analysis Now! Other store brand containing "Benzocaine"
When did the adverse event(s) occur? Did you see a doctor or a specialist with regards to these symptoms or injuries? Was your infant hospitalized as a result of this incident? Was your child diagnosed with Methomoglobonemia?